Brolio Castle is of Lombard (Longobard) origin but there are no material remains of the initial structure. 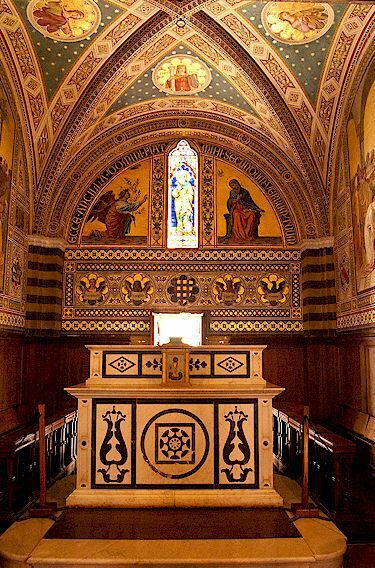 Its name derives from the Lombard word "brolo" meaning an enclosed green space or orchard. Its strategic position reflects its military importance from the Longobards onwards until as recently as WW II when it was extensively shelled. 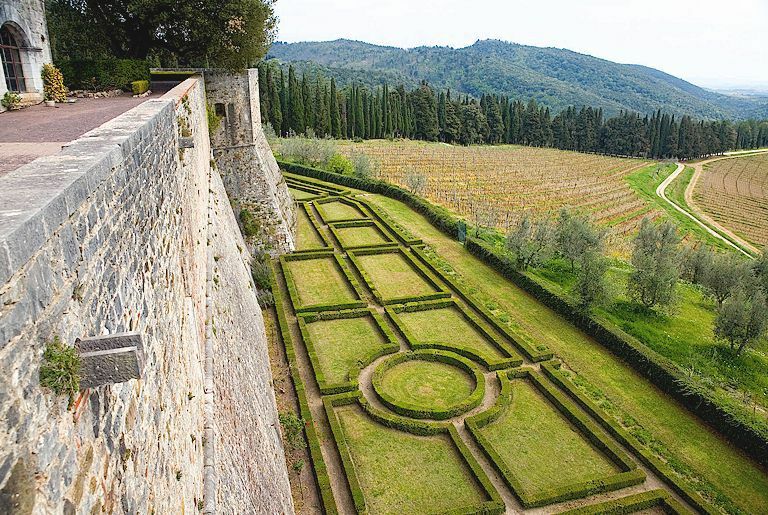 Brolio Castle is located on a hilltop near Gaiole in Chianti in the heart of the Florentine territory of the Chianti League (Lega del Chianti) formed by the terzieri of Radda, Castellina and Gaiole. Although Sienna, some 20 km away, is visible in the distance from Brolio, the castle has always been a part of the Florentine defence network with the exception of a Siennese occupation after the second Aragonese invasion of the Chianti in 1472. As a result of that occupation, when the Castello di Brolio returned to Florentine control in 1484, the Grand Duke of Tuscany, Cosimo I de Medici ordered the castle to be reconstructed to withstand the new form of artillery that resulted from the availability of corned gunpowder. Brolio is thus one of the first Italian fortresses incorporating bastions specifically designed to deflect cannon balls. The bastions are fairly primitive and form an irregular pentagon enclosing the earlier structure in its current 19 C manifestation. The bastions appear to have been the work of Giuliano da Sangallo and visitors to the castle can walk around these ramparts. 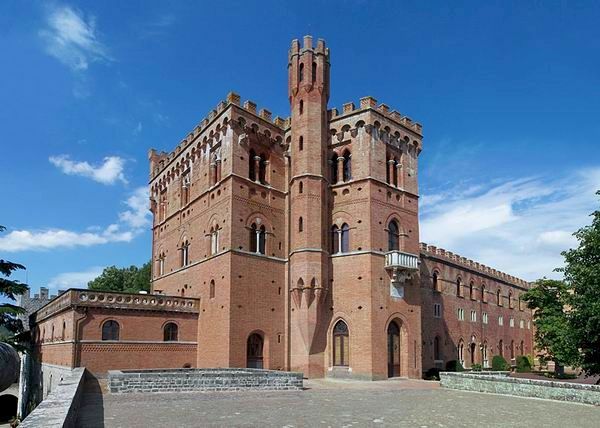 Il Castello di Brolio is documented in the 10 C and it seems that in 1009, the Lord of the castle and its district was a certain Marquis Boniface son of a Count Alberto. Brolio Castle became the seat of the Ricasoli Firodolfi of Cacchiano, a powerful feudal family, in 1141 and has remained under the control of their descendants until the present day, with the exception of a disastrous period of corporate ownership from 1963 to 1993. 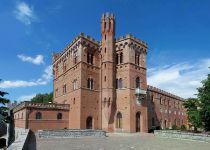 The castle as it is today is in large part a Gothic Revival creation carried out under the direction of Bettino Ricasoli, the most famous of the Ricasoli family, in 1835, under the guidance of the architect Pietro Marchetti. 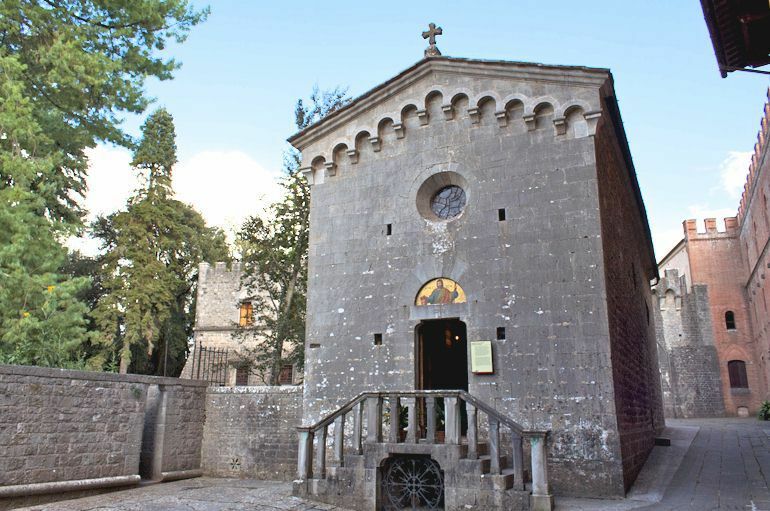 The keep and Romanesque Chapel of San Jacopo are incorporated into the Neo-gothic castle. The Neo-renaissance gardens are part of this romantic reconstruction, created by the botanist Simone Ricasoli who also planted the 19 C "romance" or "English" park around the castle. 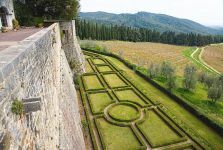 The ramparts and the gardens may be visited without charge, and there is a splendid view out over the surrounding countryside. The castle also offers a paid historical tour which includes the gardens and the museum, and a paid wine tour which includes a wine tasting. The interior apartments of the castle are not open to the public. 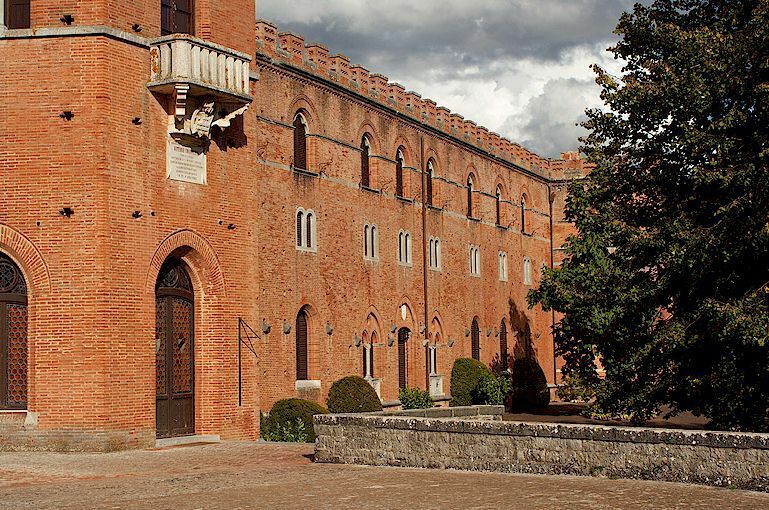 The Ricasoli company continues to produce wine and the castle is surrounded by extensive vineyards. Information on our full day Brolio Castle Wine Tasting & Chianti Scenic Tour. Baron Bettino Ricasoli was one of the most noteworthy figures of the Italian Risorgimento (Unification). His private life and public career were marked by the utmost integrity and by a rigid austerity which earned him the name of the Iron Baron. Ricasoli was born in Florence. After being left an orphan at the age of eighteen with a heavily encumbered estate, he was declared of age by special decree of the Grand Duke of Tuscany and entrusted with the guardianship of his younger brothers. He interrupted his studies and withdrew to Castle Brolio, and by careful management disencumbered the family possessions. In 1847 he founded the journal La Patria, and addressed a memo to the Grand Duke suggesting remedies for the difficulties of the state. In 1848 he was elected Gonfaloniere of Florence, but resigned on account of the anti-Liberal tendencies of the Grand Duke. 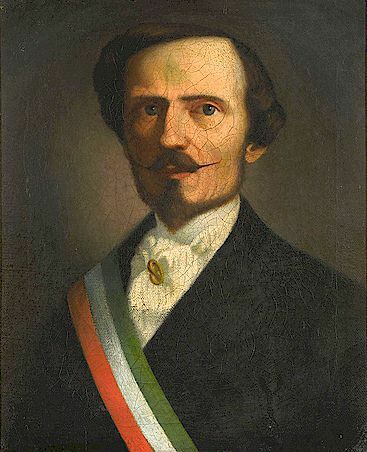 As Tuscan Minister of the Interior in 1859, he promoted the union of Tuscany with Piedmont, which took place on 12 March, 1860. Ricasoli was elected Italian deputy in 1861 and succeeded Cavour in the premiership. As premier he admitted the Garibaldian volunteers into the regular army, revoked the decree of exile against Mazzini and attempted reconciliation with the Vatican, but his efforts were rendered ineffectual by the non possumus of the Pope. 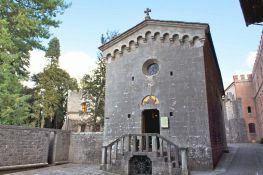 After a second unsuccessful attempt to reconcile the newly united Italy with the Papacy, this time thwarted by the Deputies, Ricasoli resigned office finally in 1866 and retired to Castello di Brolio where he died on 23 October, 1880. Baron Ricasoli was not only a vigorous if ultimately unsuccess politician, he was also an experimental agronomist. He put his results to practical use to assist the people of Chianti to rebuild after the devastation of the vineyards by the phylloxera epidemic and the widespread chaos and poverty that followed the Risorgamento. 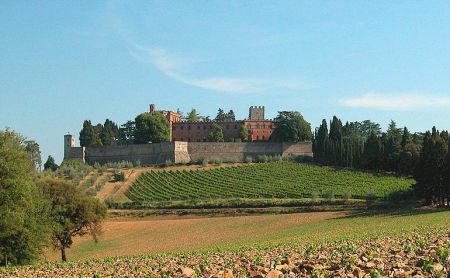 Prior to Ricasoli, Canaiolo was emerging as the dominant Tuscan grape varietal in Chianti wine, with Sangiovese and Malvasia playing supporting roles. In the mid-nineteenth century, Ricasoli developed a formula for Chianti wine that was based primarily on Sangiovese. He recommended 70% Sangiovese, 15% Canaiolo, 10% Malvasia (later amended to include Trebbiano) and 5% other local red varieties. In 1967, the Denominazione di Origine Controllata (DOC) regulation set by the Italian government established the "Ricasoli formula" of a Sangiovese-based blend with 10-30% Malvasia and Trebbiano. Since 1996, the formula for Chianti wine and Chianti Classico wine has been 75-100% Sangiovese, up to 10% Canaiolo and up to 20% of any other approved red grape variety such as Cabernet Sauvignon, Merlot or Syrah. And since 2006, the use of white grape varieties such as Malvasia and Trebbiano have been prohibited in Chianti Classico.